While growing up alongside Elkino Watson Sr., founders Alexis Moncrief and Desmond Horne shared Elkino’s passion for education and football. After succeeding in both the classroom and on the field, Elkino gained the attention of his community and of football scouts. 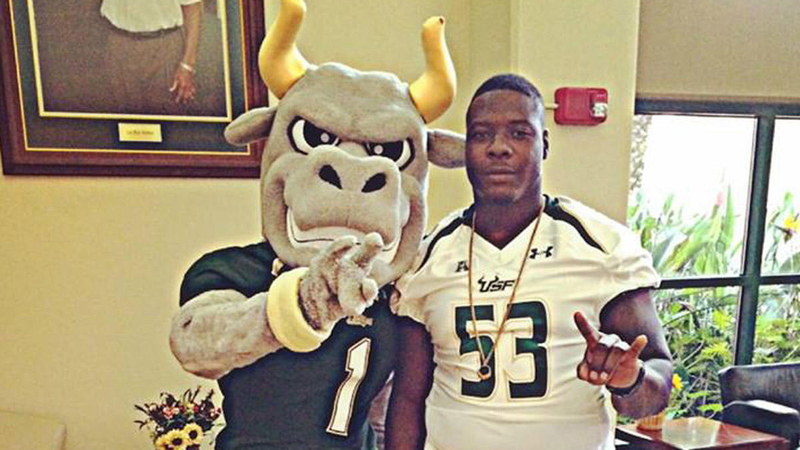 He accepted a full ride scholarship to the University of South Florida (USF) in Tampa as a starting Defensive Lineman for The USF Bulls. While at USF, Elkino had a phenomenal career that landed him a starting position all four years, captain his senior year, and All-American Conference player within the NCAA. After completing four years with The Bulls, he entered the National Football League draft, and landed a position as an undrafted free agent with the Chicago Bears. Unfortunately, Elkino’s career was cut short on September 6, 2015 due to a tragic altercation in Tampa, Florida, which resulted in his passing. Shortly after losing their friend/brother, Alexis and Desmond decided the best way to pay tribute to Elkino, was to turn tragedy into triumph. In September of 2017, BelieveInMe Foundation, Inc. was created as a 501(c)3 certified non-profit, to empower the youth of South Florida through education, violence prevention, health & wellness and community service. Since then, BelieveInMe Foundation, Inc. has offered various programs that has brought the South Florida community together! Our mission is to create a positive, and influential environment for the youth of Miami, all while honoring the life and legacy of beloved Elkino Watson Sr. We are committed to emphasizing the importance of education, violence prevention, community service, and health and wellness. The vision of this non-profit foundation is to create a positive and influential environment for the youth to succeed within the Miami community. We are committed to emphasizing the importance of education, violence prevention, community service, and health and wellness.